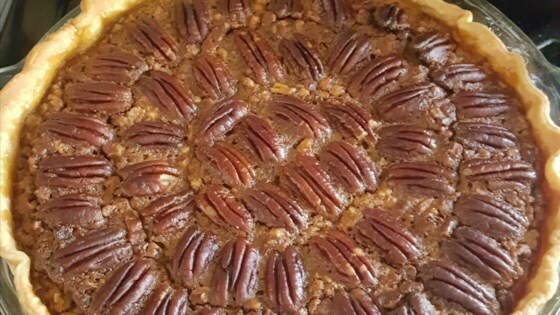 "This is a simple, yet delicious recipe to make without the syrup that most pecan pie recipes call for. It's more like a custard pie with pecans." In a large bowl, combine brown sugar, flour, margarine, milk, vanilla and eggs. Blend until smooth. Stir in chopped pecans. Pour into pie crust. Place whole pecan meats gently on top in decorative manner. This is an easy pie to make and has a very smooth texture. Absolutely great! just like the ones my great aunt used to bake. I always roast the pecans first to give an even more "old fashion" taste.